I just came across a sweet little shop selling some interesting stuff. There are special drops that will temporarily turn a person's teeth a terrible yellow if added to hot liquids like coffee. (Love that one.) Powders that can set off a sneezing fit. Mists so foul-smelling they can knock your enemy off her feet. And of course . . . "Liquid Roadkill." While I REALLY don't recommend trying these out in real life (and I doubt you can purchase them if you're under 18), it IS nice to dream. It's a legal thing. But I would worry, cause you never know what kind of allergies people have. Yeah, that's true. They might turn out to be allergic to almost everything. Where is this shop I wonder...? The drops sound like a chemist's evil prank, haha. And I notice you didn't post a link to the store's site. Liquid Roadkill, huh? Sounds suspiciously like Iris's parents' rat-repelling perfume. Does this happen to be the website? Officially awesome! I know what I'm going to do first when I turn 18. 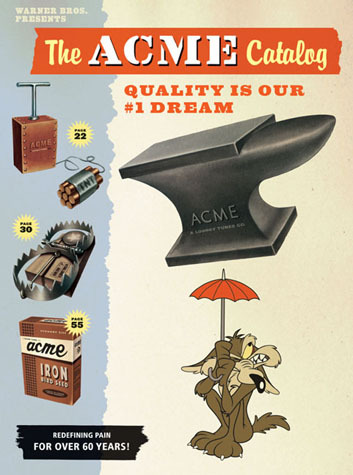 As a child I took great delight in the acme store. I mean, their like the official sponsors of roadrunner. Though I'm still a child I think.... Well when I was 5 I loved watching him get hurt Impn lovely ways. ooooooo, whats the store name? ROBERT in San Diego via cell phone. If only I didn't have to worry about the legal aspect... Seriously, if people were a little less obssessed with lawsuits, there would be way more laughter in the world.